Azerbaijan and Iran intend to establish a joint international trade company, Farhad Dejpasand, Iranian Minister of Economic Affairs and Finance, told Trend. According to him, Iran and Azerbaijan intend to establish both joint investment companies and joint investment funds. 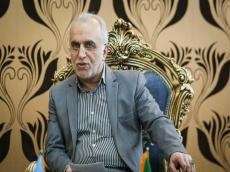 Azerbaijani and Iranian businessmen will thus be able to work together more easily, the Iranian minister added. "Necessary and essential resources will be provided by the two countries. These companies will then start operating," he said. Commenting on the Rasht-Astara railway project, Dejpasand added that there is a small technical problem with the railway project, and preliminary discussions were held on this issue in Baku. "I will soon hold necessary discussions on the issue with the Iranian side and this technical problem will soon be resolved," he said. Dejpasand said that the Rasht-Astara railroad is to be commissioned within the next 2 years. The 13th meeting of the Azerbaijan-Iran State Committee for Economic, Trade and Humanitarian Affairs was held on March 15, 2019.